Blog Watch out Chris! Mac & Murphy is on Cannon St! Watch out Chris! Mac & Murphy is on Cannon St! I know everyone is obsessed with the gloom and doom of the economy, but we must all take into consideration that businesses come and go for lots of reasons other than economics, namely the internal fortitude of the owners, having owned a small business, I know how tough it is to keep up the enthusiasm. More often than not, it is lack of motivation and good planning that leads to lack of money. 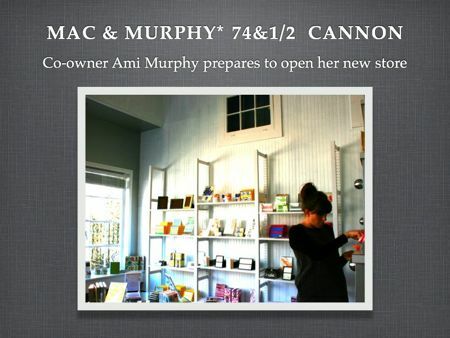 That said, people are opening businesses all the time in Charleston and I snapped this picture of Ami Murphy yesterday as she arranges products in her new, soon to open shop on Cannon St. This adorable shop in an vintage 20’s shoe store is a must see, and I can’t wait to go spend some time picking out cards to send friends at their writing station. “Is King Street losing its luster? I don’t think so whatsoever,” says Chris Price, co-founder and principal at the Prime South Group. “…All the tenants that are leaving Upper King Street … look what they’re being replaced with. They’re being replaced very quickly with higher-end, better-funded retailers and restaurants. Artist and Craftman is being replaced by Halls Chophouse, a high-end steakhouse. Wonderland’s space is already home to SIG, a bathroom and kitchen fixtures store that has moved from West Ashley. And Abmey & Company was replaced with SieMatic, a German-based kitchen outfitter. Other businesses joining the area include a restaurant called Shine and Mac & Murphy, a paper company. “When you lose a wonderful tenant and a fine two-story arts store, and you replace that with a first-class chophouse, Halls Chophouse, the level of tenant has dramatically increased. Price predicts that the upscale design trend will continue to take over the area. “It’s not just Upper King Street, it’s downtown Charleston, it’s the region,” he says. “People are coming to Charleston to shop for things they can’t get anywhere else … It’s becoming more of a destination shopping/design area and that’s wonderful for the community as a whole.